Scandinavia is one of the most beautiful areas of Europe and it is especially breathtaking in the Winter with its fjords and beautiful frozen landscapes. With this cheap flight from New York to Helsinki for $470 r/t with taxes included you can visit Finland for much less than with any other airlines. 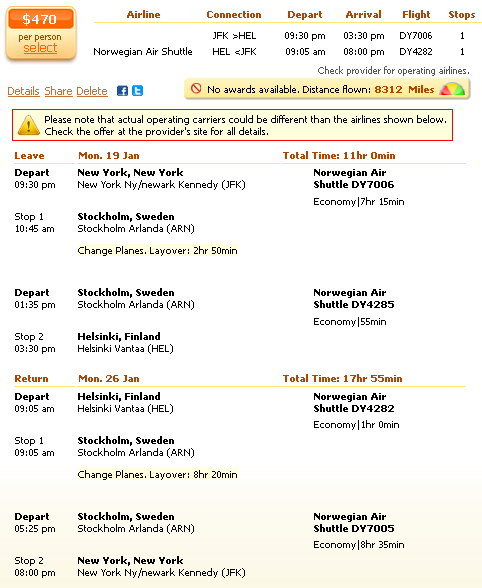 Just fly with Norwegian Air Shuttle in late January 2015.We have found this FlyFar deal while searching on Travelgrove, but you should check out the other merchants as well for a quick price comparison to find the cheapest flight to from New York to Helsinki. Your flight to Finland will fly out of John F. Kennedy International Airport (JFK) on January 19 and will return from Helsinki Airport (HEN) one week later. You will have a stop in Stockholm both ways, first for 2 hours 50 minutes and then for 8 hours 20 minute. There are no awards available for this airfare, but it’s low price is more than enough compensation for that. Book an airfare with Norwegian Air Shuttle for $470 r/t and save over $80 even compared to the next cheapest offer, an Air Berlin flight for $551 r/t. In the table you can see all the cheapest flights that we have hound. This entry was posted on Saturday, November 29th, 2014 at 11:08 am and is filed under Airfare Deals. You can follow any responses to this entry through the RSS 2.0 feed. You can leave a response, or trackback from your own site.